The Blue Jay is a common "swallowtail" of the Papilionidae family. Most of the time when encountered, it is fast-flying and skittish. Its powerful and erratic flight makes it very frustrating for a photographer who is tracking its movements. Even to the casual observer, a Blue Jay in flight is very often just a flash of blue that zips by. 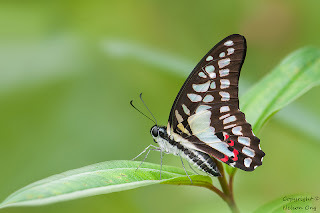 However, the butterfly is easier to photograph when it is puddling on sandy streambanks and muddy footpaths as shown in many shots in this earlier article. At other times, the Blue Jay can occasionally be observed to take a rest amongst foliage especially after feeding. This is one instance when ButterflyCircle member Nelson Ong encountered when the butterfly was at rest on a leaf of the Singapore Rhododendron, capturing the Blue Jay in its environment.